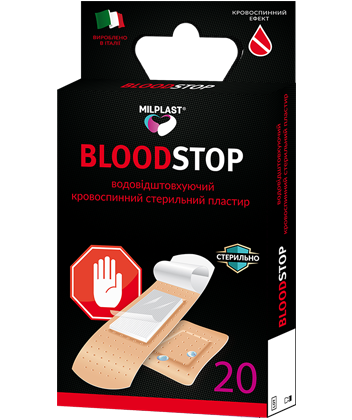 Plaster Milplast BLOODStop is used for mechanical protection of small wounds. The plaster is developed specifically for: - creating a mechanical barrier for protection against dirt and bacteria - the absorption of exudates (including blood) that is excreted from the wound. The plaster creates the optimal environment for fast blood stoppage and for its further healing through the rapid absorption of any secretions, air circulation and protection against ingress of dirt and bacteria into the wound. - Sterile double-layer gauze pad (1 layer - transparent perforated LDPE, 2 layer - chopped cellulose and binding fibers).